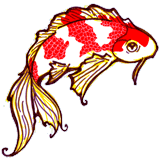 Sept 13, 2010---This post has been modified to include the most recent release. 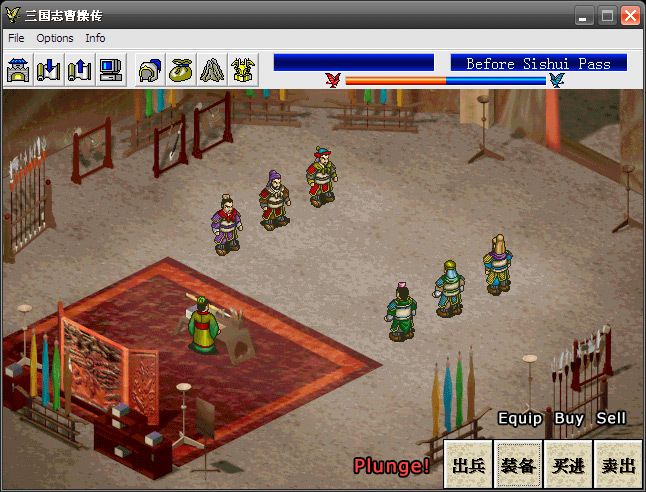 Legend of Cao Cao is a turn-based strategy game (akin to Fire Emblem) released by Koei in 1998. As it was never released in English, we have translated the game into English (from the official Chinese release) and making the patched version available here. There are currently no plans to update the game. Feel free to post suggestions about the translation and the presentation, but unless you've found a gameplay bug I'll most likely not deal with it. The one file to rule them all. Unzip into its own folder and run LoCC.exe. Last edited by Lady Wu on Fri Mar 14, 2008 7:28 pm, edited 32 times in total. Make sure you back up the original files first, as always! Thanks, Lady Wu! Does this mean I can stop trying to get used to LoCC's clunky editor now? Sun Gongli wrote: Thanks, Lady Wu! Does this mean I can stop trying to get used to LoCC's clunky editor now? Was mucking around with the exe. Lady Wu! You’ve done a wonderful job! [i]Click on an item to equip it. I clicked on the book I received (it was one of the moon letter awards that appeared in the first battle) to equip it to Cao Cao. You can use the 'next' button to switch between officers so you can give other people new moon letter gear as well. Click on a dude to assign them to a slot. More on this when I actually do something interesting in this menu. Or maybe someone else will fully elaborate on this window. Plunge! For the Plunge screen (Plunge into battle?) the darkened officers are mandatory for that battle, and the others are optional. The arrows on the tiles show how many units you have to take, so you have to use at least that many people; the blank tiles are for if you want to bring more officers than you are required to. The buttons in the corner sort the officers. I hope you know what OK and Cancel do. Played a bit with the translation. Looks good so far. "Working" means I tested it, not that the ones not listed don't work. Everything so far works, but pre-Hulao, Li Dian's last line has a stray "g" in the corner of the box. Cao Cao, Xiahou Dun, Xiahou Yuan, Cao Hong, Liu Bei, Zhang Fei, and Guan Yu. Zhang Bao, Zhang Liang, Guo Si, Li Jue, Li Su, Lu Bu, Xiahou Dun, Xiahou Yuan, Cao Ren, Yu Jin, Cheng Pu, Huang Gai, Sun Jian, Tao Qian. Guan Yu/Hua Xiong: Works, no problems. Zhang Fei/Lu Bu: Works, but on Lu Bu's last line, the side of the box has some misc. symbols on it. Guan Yu/Lu Bu: Works, but on Guan Yu's first line, the side of the box has some misc. symbols on it. "That's what every man of the emperor's thinks." Could be: "That's what all the Emperor's men think"? "The fortune of the Han is ended." Could be: "The fortune of the Han has ended/is over."? "It's only this way would Yuan Shao be willing to provide money for the cause." Could be: "This is the only way Yuan Shao..."? "Defeat Zhang Bao and Zhang Liang" goes off and wraps around the screen. I guess it can't be helped, though, unless you want to try a smaller font? At the end of the Yellow Turban's battle, when Lui Bei says "We can worry about the future when we get there", there is a stray "n" in the corner of the dialog box. In the Chapter 1 title, Chapter 1 is untranslated, although "The Hegemon" is in English. 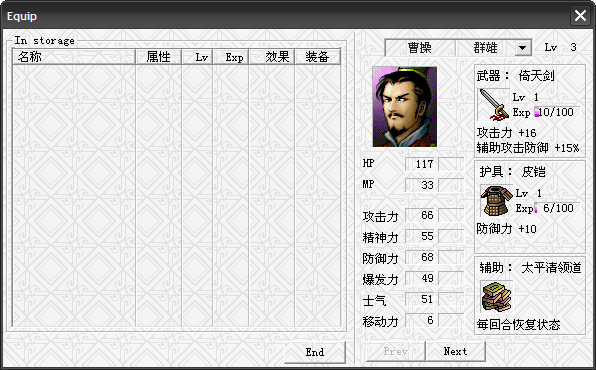 In the menu screen, when you click a button the first time and Cao Cao talks to an officer, it is untranslated. However, when Cao Cao says "Let's go" after deploying, that is translated. You probably knew this, just pointing it out. At Sishui pre-battle, when Cao Cao says "... to fight well, we will be viewed more highly by others. ", there is a stray "y" in the corner of the dialog box. Before battles, on the tile-background sceen, it's blank now. Is it supposed to be this way? At Yingyang, when Lu Bu appears and says his line, there is a stray period in the corner. Stray letters all squished! Thanks! 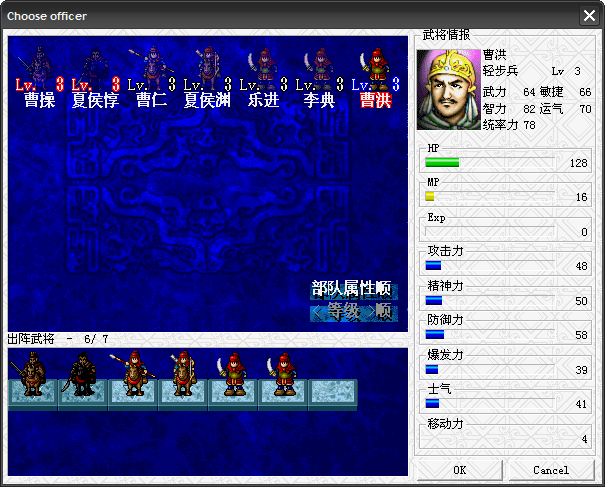 Taishi Ci 2.0 wrote: "Defeat Zhang Bao and Zhang Liang" goes off and wraps around the screen. I guess it can't be helped, though, unless you want to try a smaller font? Yeah, I need to figure out how to squish the font size. This one I could reword as "Kill Zhangs Bao and Liang" or something, but there are other cases that don't work as well. Battle descriptors, like "Battle of Yingchuan", need to be a few font sizes down (as you'll see with longer battle names). It should be in the exe when I can find it. Yeah. When you're equipping/buying/selling, the dialogue is in the exe. The exe is really unforgiving in line length, so I may have to revert to early ROM-hack translation speech. I need to figure out what to do with item names, too (you get at most 5 ASCII characters per item name. Eep!). How do you mean? Screenshot please? Thanks so much James and Taishi. I can't trigger all the dialogue and events on my own, so it helps to have extra pairs of eyes to look out for stuff! I'm not going to touch the exe today. I must have mucked around with it too much yesterday and it started to chew up my save files (James, did you figure out what was going on? Did things clear up when you used the original exe?). Taishi Ci 2.0 wrote: For the Plunge screen (Plunge into battle?) the darkened officers are mandatory for that battle, and the others are optional. The arrows on the tiles show how many units you have to take, so you have to use at least that many people; the blank tiles are for if you want to bring more officers than you are required to. The buttons in the corner sort the officers. I hope you know what OK and Cancel do. Lady Wu wrote: Yeah, I need to figure out how to squish the font size. This one I could reword as "Kill Zhangs Bao and Liang" or something, but there are other cases that don't work as well. Battle descriptors, like "Battle of Yingchuan", need to be a few font sizes down (as you'll see with longer battle names). It should be in the exe when I can find it. I guess even SHelm is good? MBean! (Are there multiple beans? 1Bean, 2Bean; ABean, BBean). You’re welcome! Plenty of harassment yet to come! I’m going to take another swing at it soon! Right now I’ve got to siphon through all the routine house-tasks (and health tasks!) that the bloody elves have stopped doing for me. I just noticed something weird. I'm playing with my English hacked exe, and the descriptors of the saves go weird during battle (James, this may be our problem last night). When I'm saving in camp, the location overwrites the descriptor of the previous save. So, if I'm in the camp during the scenario "Raising an army - before Sishui Pass", and I save over a game called "Battle of Yingchuan, round 1", the name will come out as "Raising an army - before Sishui Pass". But if I'm in the Battle of Sishui, round 4, saving over "Battle of Yingchuan, round 1", it comes out as "Raising an army - Battle of Sishui Pass -Battle of Yingchuan, round 1". I don't know what causes this, but this may be the thing that corrupts the files after several recursions. Regarding names and items: the descriptions of the items and tactics, as well as the mini-biographies of the characters, are in Imsg.e5. That file contains a generous amount of blank space (not infinite, but way more than just an extra byte per item, unlike in *cough* ekd5.exe *cough*). I was just thinking that even if I don't hack the exe, I could just put the item name and description in those little boxes populated by Imsg.e5, and people can just right-click on the item/character to get the relevant info.